In January, the Graphic History Collective (GHC) launched Remember | Resist | Redraw: A Radical History Poster Project to intervene in the Canada 150 conversation. 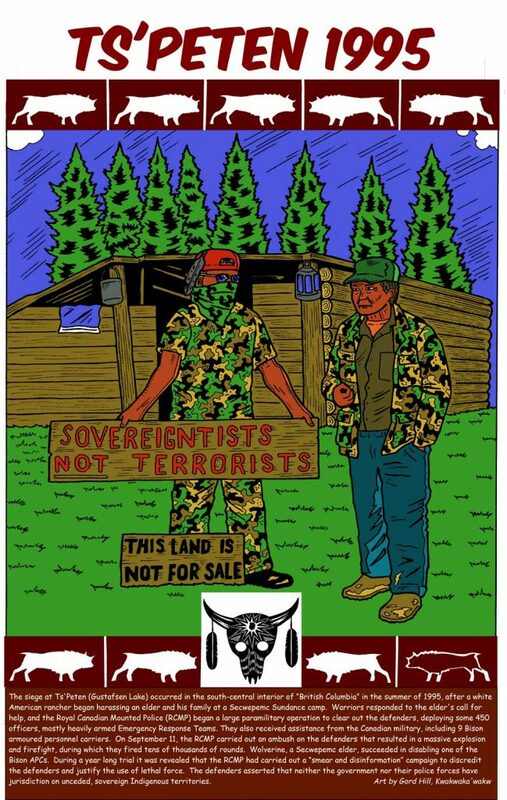 Earlier this month (just after BC Day) we released Poster #09 by Gord Hill, which looks at when the RCMP attacked Secwepmec land defenders in the interior of British Columbia in the summer of 1995. It was the largest paramilitary operation in British Columbia and cost over $5 million. The siege at Ts’Peten (Gustafsen Lake) occurred in Secwepemc territory (in the south-central interior of “British Columbia”) in the summer of 1995, after a white American rancher began harassing an elder and his family at a Secwepemc Sundance camp. Warriors responded to the elder’s call for help, and the Royal Canadian Mounted Police (RCMP) began a large paramilitary operation to clear out the defenders, deploying some 450 officers, mostly heavily armed Emergency Response Teams. They also received assistance from the Canadian military, including nine Bison armoured personnel carriers (APCs). During the siege, which began in mid-August, the RCMP cut off all communications from the defender’s camp. Corporate media reported only the police version of events. During a year-long trial it was revealed that the RCMP had carried out a self-described “smear and disinformation” campaign to discredit the defenders and justify the use of lethal force. Local band councils from the northern Secwepemc collaborated with police and publicly denounced the defenders, further legitimizing the police operation. On September 11, the RCMP carried out an ambush that began with the detonation of a large explosive device, which disabled a truck used by the defenders. The truck was then rammed by one of the Bison APCs, beginning an hours-long firefight during which police fired tens of thousands of rounds. Wolverine, a Secwepemc elder, succeeded in disabling one of the Bison APCs. Incredibly, only one person was injured—a defender who was grazed in the arm by a police bullet. The next day, an RCMP sniper opened fire on an unarmed defender walking in a previously agreed upon “no shooting” zone, claiming the person was wearing camouflage fatigues and carrying a weapon. During the trial of the defenders, it was revealed that the person was in fact unarmed. The RCMP filmed most of their activities and meetings as a training aid for future operations against Indigenous land defenders. It was during one of these meetings that the RCMP media spokesperson, Sergeant Peter Montague, claimed that “smear campaigns are our specialty.” In addition, they had large amounts of surveillance footage from aircraft flying overhead during most of the siege. The RCMP also fabricated shooting incidents to justify the deployment of the Bison APCs, including shooting up one of their vehicles and claiming that defenders had ambushed a police patrol. No surveillance footage of this incident was ever released, however, and defenders claimed they never carried out such an attack. The New Democratic Party, a supposedly “progressive” provincial political party in power at the time, authorized the police operation as a means of winning over disaffected voters and diverting attention away from numerous corruption scandals that had undermined their legitimacy. Throughout the siege, government and police officials demonized the defenders as members of a cult, as “squatters” and terrorists. They portrayed their demands as absurd. The defenders asserted that neither the government nor their police forces have jurisdiction on unceded, sovereign Indigenous territories, a widely held belief among Indigenous peoples throughout the province (most of which remains unceded Indigenous territory due to the lack of treaties). Gord Hill is a member of the Kwakwaka’wakw Nation on the Northwest Coast. Writer, artist, and militant, Gord has been involved in Indigenous resistance, anti-colonial, and anti-capitalist movements for many years, often using the pseudonym Zig Zag. Hill, Gord. The 500 Years of Resistance Comic Book. Vancouver: Arsenal, 2010. Hill, John Boncore. The Autobiography of Dacajeweigh/Splitting the Sky: From Attica to Gustafsen Lake. Chase, BC: John Pasquale Boncore, 2001. Lambertus, Sandra. Wartime Images, Peacetime Wounds: The Media and the Gustafsen Lake Standoff. Toronto: University of Toronto Press, 2004. Switlo, Janice G.A.E. Gustafsen Lake: Under Siege: Exposing the Truth Behind the Gustafsen Lake Stand-Off. Peachland, BC: TIAC Communications Ltd., 1997.